Sambucus is a genus of flowering plants in the family Adoxaceae. The various species are commonly called elder or elderberry. The genus was formerly placed in the honeysuckle family, Caprifoliaceae, but was reclassified as Adoxaceae due to genetic and morphological comparisons to plants in the genus Adoxa. The oppositely arranged leaves are pinnate with 5–9 leaflets (rarely 3 or 11). Each leaf is 5–30 cm (2.0–11.8 in) long, and the leaflets have serrated margins. They bear large clusters of small white or cream-colored flowers in late spring; these are followed by clusters of small black, blue-black, or red berries (rarely yellow or white). Ornamental varieties of Sambucus are grown in gardens for their showy flowers, fruits and lacy foliage. Native species of elderberry are often planted by people wishing to support native butterfly and bird species. Elderberry fruit or flowers are used as dietary supplements for minor diseases such as flu, colds, constipation, and other conditions, often served as a tea, extract, or in a capsule. There is insufficient research to know its effectiveness for such uses, or its safety profile; however, no illnesses caused by elderflower have been reported. 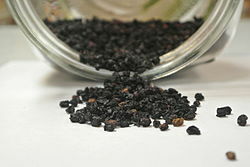 Raw elderberries are 80% water, 18% carbohydrates, and less than 1% each of protein and fat (table). In a 100 gram amount, elderberries supply 73 calories and are a rich source of vitamin C, providing 43% of the Daily Value (DV). Elderberries also have moderate contents of vitamin B6 (18% DV) and iron (12% DV), with no other nutrients in significant content (table). The French, Austrians and Central Europeans produce elderflower syrup, commonly made from an extract of elderflower blossoms, which in central Europe is added to Palatschinken filling instead of blueberries. People throughout much of Central, Eastern, and Southeastern Europe use a similar method to make a syrup which is diluted with water and used as a drink or as a flavoring in several food products. Fruit pies and relishes are produced with berries. Romanians produce a traditional soft drink in May and June called "socată" or "suc de soc". It is produced by letting the flowers macerate with water, yeast and lemon for 2–3 days. The last stage of fermentation is done in a closed pressure proof bottle to produce a fizzy drink. The beverage has also inspired Coca-Cola to launch an elderflower-based drink, Fanta Shokata. 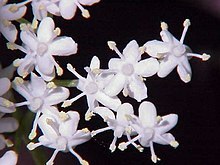 The flowers of Sambucus nigra are used to produce elderflower cordial. St-Germain, a French liqueur, is made from elderflowers. Hallands Fläder, a Swedish akvavit, is flavoured with elderflowers. Despite the similarity in name, the Italian liqueur sambuca is mostly made with star anise and fennel essential oils extracted by vapor distillation. It also contains elderflower extracts with which it is flavored to add a floral note, to smooth and round off the strong licorice flavor. Although the ripe, cooked berries (pulp and skin) of most species of Sambucus are edible, uncooked berries and other parts of plants from this genus are poisonous. Leaves, twigs, branches, seeds, roots, flowers, and berries of Sambucus plants produce cyanidin glycosides and alkaloids, which have toxic properties. Ingesting a sufficient quantity of cyanidin glycosides and alkaloids from berry juice, flower tea, or beverages made from fresh leaves, branches, and fruit has been shown to cause illness, including nausea, vomiting, abdominal cramps, diarrhea, and weakness. In August 1983, a group of twenty-five people in Monterey County, California became suddenly ill by ingesting elderberry juice pressed from fresh, uncooked Sambucus mexicana berries, leaves, and stems. The density of flavonoids (including cyanidin glycosides) is higher in tea made from flowers than it is in berries, and overall density of cyanidin glycosides is lower in flowers and berries collected from low-altitude trees compared to those at higher elevations. Elderberries are rich in anthocyanidins that combine to give elderberry juice an intense blue-purple coloration that turns reddish on dilution with water. These pigments are used as colorants in various products, and "elderberry juice color" is listed by the USFDA as allowable in certified organic food products. In Japan, elderberry juice is listed as an approved "natural color additive" under the Food and Sanitation Law. Fibers can be dyed with elderberry juice (using alum as a mordant) to give a light "elderberry" color. Although practitioners of traditional medicine have used black elderberry for hundreds of years, including as wine intended for treating rheumatism and pain from traumatic injury,[page needed] there is no scientific evidence that such practices have any beneficial effect. 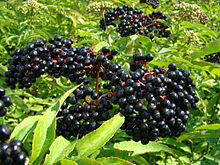 Additionally, black elderberry has been utilized as a treatment for flu symptoms. While some preliminary research indicates that elderberry may relieve flu symptoms, the evidence is not strong enough to support its use for this purpose. In Northern California, elderberries are a food for migrating band-tailed pigeons. Elders are used as food plants by the larvae of some Lepidoptera species including brown-tail, buff ermine, dot moth, emperor moth, engrailed moth, swallow-tailed moth and the V-pug. The crushed foliage and immature fruit have a strong fetid smell. Valley elderberry longhorn beetles in California are very often found around red or blue elderberry bushes. Females lay their eggs on the bark. The pith of elder has been used by watchmakers for cleaning tools before intricate work. Elder commonly grows near farms and homesteads. It is a nitrogen-dependent plant and thus is generally found near places of organic waste disposal. Elders are often grown as a hedgerow plant in Britain since they take very fast, can be bent into shape easily and grow quite profusely, thus having gained the reputation of being 'an instant hedge'. It is not generally affected by soil type or pH level and will virtually grow anywhere sufficient sunlight is available. Folklore related to elder trees is extensive and can vary according to region. In some myths, the elder tree is thought to ward off evil and give protection from witches, while other beliefs say that witches often congregate under the plant, especially when it is full of fruit. If an elder tree was cut down, a spirit known as the Elder Mother would be released and take her revenge. The tree could only safely be cut while chanting a rhyme to the Elder Mother. Made from the branch of an elder tree, the Elder Wand plays a pivotal role in the final book of the Harry Potter series, which was nearly named Harry Potter and the Elder Wand before author J. K. Rowling decided on Harry Potter and the Deathly Hallows. ^ "Sambucus L". Germplasm Resource Information Network. United States Department of Agriculture. 2005-10-13. Archived from the original on 2009-05-07. Retrieved 2009-07-23. ^ "Sambucus — The Plant List". www.theplantlist.org. Retrieved 2017-10-17. ^ Eriksson, Torsten; Donoghue, Michael J. (1997). "Phylogenetic Relationships of Sambucus and Adoxa (Adoxoideae, Adoxaceae) Based on Nuclear Ribosomal ITS Sequences and Preliminary Morphological Data". Systematic Botany. 22 (3): 555–573. doi:10.2307/2419828. JSTOR 2419828. ^ Johnson, M. C; Thomas, A. L; Greenlief, C. M (2015). "Impact of Frozen Storage on the Anthocyanin and Polyphenol Content of American Elderberry Fruit Juice". Journal of Agricultural and Food Chemistry. 63 (23): 5653–5659. 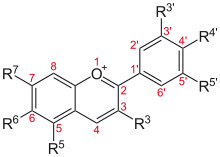 doi:10.1021/acs.jafc.5b01702. PMC 4472577. PMID 26028422. ^ a b c d e f g h "European elder". National Center for Complementary and Integrative Health, U.S. Department of Health & Human Services, National Institutes of Health. September 2016. Retrieved 8 November 2016. ^ a b c "Elderberry (Sambucus species); Poison plant section". Nova Scotia Museum. ^ a b c Senica, M; Stampar, F; Veberic, R; Mikulic-Petkovsek, M (2016). "The higher the better? Differences in phenolics and cyanogenic glycosides in Sambucus nigra leaves, flowers and berries from different altitudes". Journal of the Science of Food and Agriculture. 97 (8): 2623–2632. doi:10.1002/jsfa.8085. PMID 27734518. ^ a b Centers for Disease Control (CDC) (April 6, 1984). "Poisoning from Elderberry Juice—California". Morbidity and Mortality Weekly Report. 33 (13): 173–174. PMID 6422238. Retrieved December 15, 2012. ^ Viapiana, A; Wesolowski, M (2017). "The Phenolic Contents and Antioxidant Activities of Infusions of Sambucus nigra L". Plant Foods for Human Nutrition. 72 (1): 82–87. doi:10.1007/s11130-016-0594-x. PMC 5325840. PMID 28084608. ^ Processing Fruits: Science and Technology (Second ed.). CRC Press. 2004. pp. 322–324. ISBN 9781420040074. Retrieved 20 August 2018. ^ Burgess, Rebecca (2011). Harvesting Color: How to Find Plants and Make Natural Dyes. Artisan Books. pp. 74–75. ISBN 9781579654252. Retrieved 20 August 2018. ^ A Modern Herbal | Elder. Botanical.com (1923-01-06). Retrieved on 2011-03-06. ^ Flaws, Bob (1994). Chinese Medicinal Wines and Elixirs. Blue Poppy. ISBN 978-0-936185-58-3. ^ Diacono, Mark (15 June 2013). "In praise of the elderflower". The Telegraph. Retrieved 10 September 2017. ^ Jen Munson (25 October 2016). "Consider warding off witches, monsters with these spooktacular herbs this Halloween". The News-Herald, Digital First Media, Denver, CO. Retrieved 10 September 2017. ^ Groves, Beatrice (2017). Literary Allusion in Harry Potter. Taylor & Francis. p. 50. ISBN 9781351978736. Retrieved 3 November 2017. ^ Brown, Jen (30 July 2007). "Confused by Potter? Author sets record straight". TODAY. Retrieved 3 November 2017. Wikimedia Commons has media related to Sambucus. This page was last edited on 23 April 2019, at 11:35 (UTC).